Eagle F1 GS-D3 Combination high performance tread compound, V-tred pattern design and new casing shape delivers maximum resistance to aquaplaning and extreme levels of wet handling. Continuous centreline delivers improved on-centre steering feel, improved steering precision and fast steering response. Asymetric rib angle design increases lateral stiffness with consequent improved steering performance Very long tread grooves running perpendicular to the footprint edge and optimised tread design provides reduced noise on smooth road surfaces. 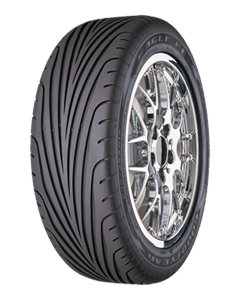 Sorry, we currently do not have any tyres with the EAGLE F1 GS-D3 pattern in stock.